It’s not really about the tech, but what teachers and students can do with it. Educators who meet virtually throughout the year get to meet face-to-face in Atlanta. ISTE 2014 was quite different from previous ISTE conferences. There wasn’t a “hot, new thing” circulating that people wanted to talk about or that vendors were relying on to draw attendees. This year’s conference inspired a different conversation thread: teaching matters. People were actively discussing how teachers are designing active learning environments and experiences that engage students through technology. These conversations often led to talk about tools, including tablets and iPads, Chromebooks, Web-based resources, assessment tools, classroom technologies, and other technology resources. 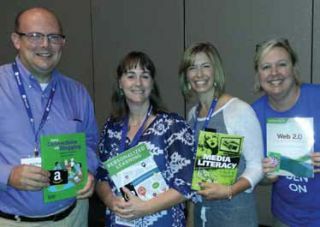 However, much of the dialogue at ISTE 2014 was structured around teaching and learning. These conversations also uncovered the reality that every school is on a different path in creating modern learning environments. Unfortunately, challenges of time, funding, leadership, outside regulations, and fractured expectations often stand in the way of innovative educators. Navigating these challenges seemed to be at the heart of many side conversations in the Blogger’s Cafe or panel discussions. There was a decrease in the number of sessions that showed how to operate a tool or application. There was an increase in offerings that focused on strategies for new ways of learning. There were more stories about how to create innovative learning experiences, especially from the classroom teacher’s perspective. There was also a change of focus in the Exhibit Hall. Many vendors turned their booths into makeshift classrooms and invited educators to share their stories and student artifacts. Perhaps this year’s conversations will lead to next year’s presentations focusing more on teaching, learning, coaching, and changing the classroom experiences for our students. I hope that educators and those who are leaders within ISTE will continue to realize that the “hot, new thing” in education is not what makes the most difference in our classrooms. It’s the expertise and passion of our teachers, combined with the desire to know the needs of our students, that makes the biggest difference.